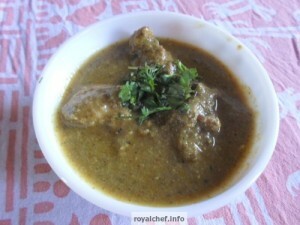 This is a Recipe for preparing at home Spicy Maharashtrian Chicken Korma, prepared in the authentic Maharashtrian Style of cooking. Roast the Nuts and Poppy Seeds and put them in a blender. Make Ginger-Garlic Paste with Coriander and Mint Leaves. Blend Coconut with fine paste. Prepare Onions paste. Heat the Oil in a Kadhai and add Ginger-Garlic Paste, Coconut and fry for two-three minutes. Add Onion and fry for two-three minutes. Add roasted nuts and Poppy Seeds paste and fry until Oil Leaves the sides. Add Chicken and keep it on slow fire for five-then minutes. Add Coriander Powder, Turmeric Powder, Chili Powder, Garam Masala Powder and Lemon Juice fry until Oil separates. Beat the Curd nicely and then add the Curd and Water. Cook until Chicken is tender.